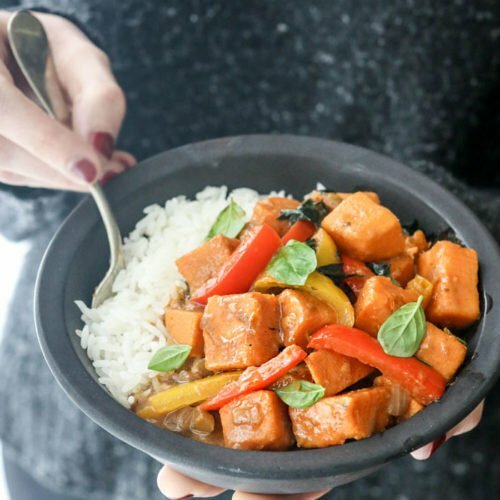 This vegan coconut curry is a quick and affordable way to enjoy your favorite takeout flavors at home. I love how you can make it with just a few ingredients that you probably already have in your pantry! 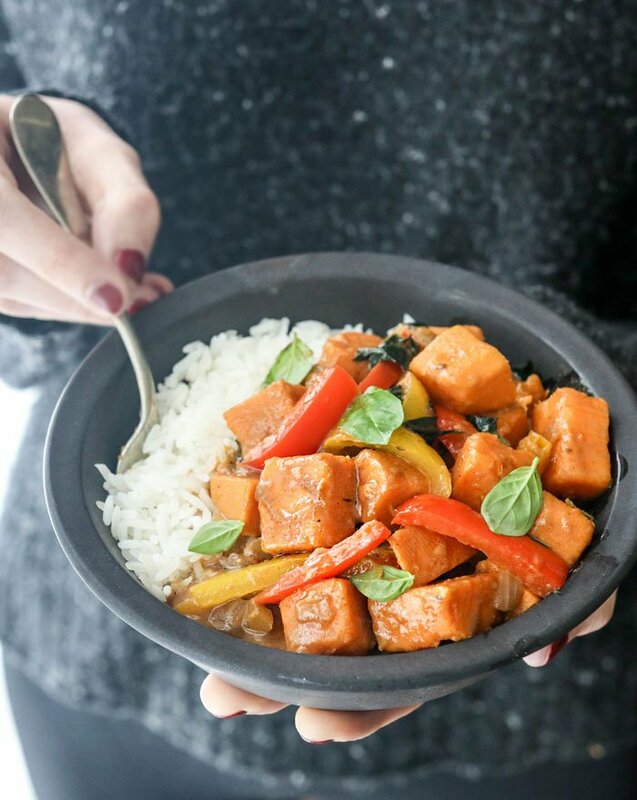 Making your own vegan coconut curry at home is as simple as stirring together some coconut milk, spices, and vegetables. You can make it heartier by adding some lentils, like in my Lentil & Sweet Potato Curry recipe, but the recipe below is entirely vegetable based. I love serving it over cooked quinoa as a complete source of protein for the meal, but you can serve it over white or brown rice, too. When I’m in a hurry, I’ll use a bag of frozen vegetables instead of chopping fresh ones (frozen tend to cook faster, too!). This recipe is easily adaptable, so feel free to use whatever you have on hand. Heat the olive oil in a large pot over high heat, and sauté the onions until they start to soften, about 5 minutes. Add in the garlic and stir for one more minute. Taste the sauce and adjust any other flavors as needed (keep in mind that the addition of veggies will dilute the saltiness), then bring the sauce to a simmer and add in the chopped sweet potatoes. Cover the pan, and allow the sweet potatoes to steam in the sauce for 5 minutes. Remove the lid and add the rest of the vegetables, since non-starchy vegetables will cook faster than the sweet potatoes. Stir the vegetables to coat them in the sauce, then cover the pot again. Lower the heat and cook until the sweet potatoes and vegetables are fork-tender, about 8 to 10 more minutes. Serve the vegetables and curry sauce over cooked rice, quinoa, or cauliflower rice. Leftover curry can be stored in the fridge for up to 4 days. *When using canned coconut milk, I like to use this brand since it's BPA-free. You can also make your own coconut milk, if you prefer, by blending together the water and meat of a fresh young Thai coconut. (The type with a shaved white exterior.) There's no need to strain this type of homemade milk, since you want it thick like the canned version. One can of coconut milk is the equivalent of 1 3/4 cup fresh coconut milk. For the vegetables in the photos here, I used a red and yellow bell pepper, plus two large handfuls of chopped kale. I also love this dish with cauliflower florets, or a pound of frozen assorted vegetables. I use tamari to keep this recipe gluten-free, but you can use soy sauce if you don’t need to be gluten free. For a soy-free recipe, try coconut aminos instead, and add a little extra salt, if needed. Reader Feedback: What’s your favorite type of take-out food? Thai food had been ours up until recently, but now we hardly have the need for it! My fiance and i are in love with this recipe. We use rice instead of quinoa and then sweet potato and cauliflower…It’s the best.. Thanks!!! I made this last night and was super happy with it! I love sweet potatoes and was super excited I have another meal to include them in! Thank you! Made this for dinner and it was super fast and omg…Delicious!!! 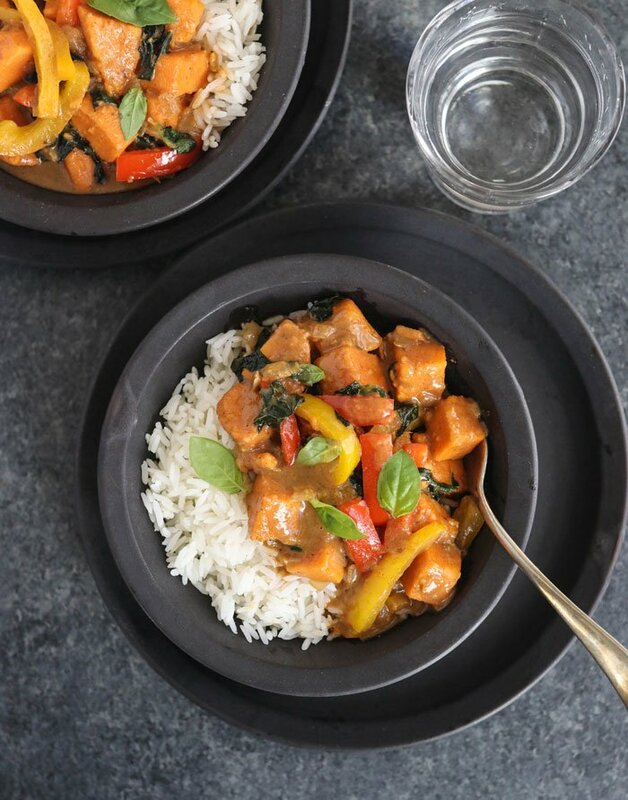 I was really craving coconut curry , so I did a search and found the lovely recipe. The pictures are beautiful and it looked delicious. I made it last night and didn’t have coconut milk, but had coconut cream, so I used that instead. Big mistake because I didn’t realize how much sugar is in coconut cream and still added the 1 T. of maple syrup. The sauce came out WAY too sweet and I ended up adding whole milk to try and dilute the sweetness. It helped, but now I think I might go out to buy coconut milk – unsweetened – to add to the leftovers so we can still enjoy it – it made a lot of food. I added extra firm tofu and sauteed before hand. I omitted the sweet potato and glad I did – would have been even sweeter had I added that. I did add sauteed red and green peppers as well. I think it’s worth another go since I was the one who messed it up :-). I don’t think I will add the maple syrup next time and will taste the sauce FIRST and then see if it needs it. Maybe add LESS maple syrup. This has officially been added to our meal rotation! So yummy! Thank you!! I LOVE this recipe! Basically a staple for me. I am just wondering if you (or anyone else) has tried using a combo of spices instead of just curry? Like coriander, cumin, tumeric, etc, and in what proportions? I was thinking of experimenting tonight but will hate if I screw up a batch! This recipe was simple and so satisfyingly good!! This will become a regular in our house. THANKS for the yummy easy recipes. This is the first time that I have left a comment on a recipe that I have tried on Pinterest but I just had to post this! This easy meal was not only quick to make but it was absolutely delicious! I made mine with Red Quinoa! Thanks for posting this! It will be a new addition to my Indian recipes! It’s really good with Chicken Masala! I eat for my blood type and coconut milk is not on my list of good foods for me. To make this sauce, could I substitute soy or almond milk? Any suggestions? This look fantastic! I will be making this for dinner tonight and will add some left over turkey I have in the freezer! Yummy! Transported me to an Indian or Thai restaurant it was so good. Used only chopped kale and carrots for veggies, and mixed the cooked quinoa directly into the sauce before serving. Now I have a go-to versatile curry recipe that tastes fantastic! this sauce is wicked good! Totally authentic tasting curry in a matter of minutes. Hi! I have never made any sort of Curry before, but have had it many times in restaurants, and have quite enjoyed it. However, this recipe didn’t taste like what I remember, and the sauce seems to have a pumpkin pie aftertaste. My other family members also said that it seemed to have an aftertaste of pumpkin pie, so I know it’s not just me. Have you ever heard this before? Is there a particular ingredient that might be causing this flavor? Did we purchase the wrong kind of Curry powder? I made it tonight and added 4 drops of lemon oil, and used cauliflower, broccoli, celery, onion, green pepper and chicken, all stir fried in coconut oil prior to adding to sauce. I threw in a handful of peanuts and some unsweetened coconut to garnish. Mild but tasty. Made this tonight using a new bottle of curry powder and the sauce was delicious. However, the sweet potatoes cooked quicker than I expected and I ended up spooning them out before adding all my other vegetables. Then the veggies cooked longer than I intended due to waiting for a friend to come to dinner. In the end, the sauce had lost it’s flavor. 🙁 Do you think the extra simmering combined with the water leaching from the vegetables is what did this? Next time I’ll make sure my vegetables are ready to go in and don’t get overcooked, but maybe I should just steam them first also and not cook the curry so long? Does curry sauce lose it’s flavor when simmered for too long? I found this recipe to be addictive. SOOOOO good! I really love how simple it is to make also. Each bite with sweet potato was even better! What a fantastic combo! I could seriously eat this every night. Unfortunately my husband and kids did not like this. Maybe for this recipe you have to like curry? Of course I DON’T typically like curry but I LOVE this recipe. Go figure. Like Terry, I am wondering if this meal can be made ahead of time and frozen? I have a large crowd coming and wish to get as much done ahead of time as possible. Can’t wait to try it! I made this tonight and it was delicious! My husband and I both loved it, as did my 2 and 4 year olds. Next time I will have to double it, because we ate it all in one sitting! I made this tonight. Delicious! Made this recipe last week and it is delicious! My husband really liked it as well. Thanks so much for posting this and for all the other wonderful recipes as well. I almost never post comments on blogs but this recipe is so good I just have to leave a comment! Only took 30 minutes to make from start to finish using broccoli, carrots, and peas. Such a simple and clean tasting meal, I’ll definitely be making this again soon. I made this dish for the first time tonight. My entire family loved it!I decreased curry powder to 1 T. to make it more kid friendly and increased maple syrup to 2 T. total. GREAT RECIPE…very quick to make and I always have the ingredients on hand! This was delicious! My husband thought it was fantastic! Thanks! I just made this wonderful curry and used honey (didnt have maple syrup) and I have to say it was so yummy my hubby & I polished off two plates each. It was the best….thank you for a great recipe website. Also wanted to mention I made the cauliflower based pizza last night and that was also a hit! Easy to make and delicious. Definitely will be on my list to make again soon. (and again, I’m sure.) Thanks for all your great recipes – haven’t tried one yet that wasn’t delicious. This is my kind of curry! I can’t wait to make this for dinner for my family. I love thai and indian take out! My weekly treat is Indian take out every Sunday 😉 I am a creature of habit. Can’t wait to try this delicious looking recipe! Thanks!! YUM! I seriously love curry and Thai food is one of my favorites. This looks incredible and so easy to make. I don’t like the taste of coconut milk. Can I use almond or hemp milk? How can I make the consistency similar to coconut milk? I’m so excited to try out this recipe! Definitely will be doing it sometime this weekend. I’ve been all on the curry train randomly. Wow, sounds great! I’ve been looking for a coconut curry recipe lately, so now I know what to make. 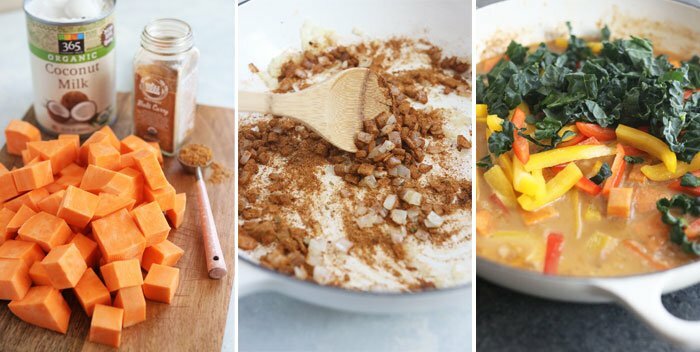 What’s in the sauce in the first picture — did you use white sweet potatoes? Yep, they’re white sweet potatoes! Where can I find white sweet potatoes? I found them at Whole Foods, next to the regular sweet potatoes. This curry sounds wonderful! It seems fast and easy to make too — always a plus!